US 119 begins at US 25E in Pineville, Kentucky, travels along the eastern border of the state, and exits into West Virginia near South Williamson, Kentucky. As US 119 travels along the Tug Fork of the Big Sandy River in West Virginia, it crosses back over into Kentucky a few times. H.B. Elkins will be hosting an Eastern Kentucky Road Enthusiast Meeting this Saturday, May 21 in Pikeville. After lunch, the group will go on an informal tour of the US 119 reconstruction project north of Pikeville. For more information or to RSVP, please contact H.B. Elkins at kyroadgeekreply@yahoo.com . Local, state, and federal officials will gather in Letcher County on April 22 to celebrate improvements to US 119�s crossing of Pine Mountain. The improvements include the widening of shoulders and the addition of passing lanes on the climb up the mountain. The day�s events will include exhibits at the Pine Mountain Grill and a 11:00am ceremony at the new overlook on US 119. Despite recent spot improvements to US 119 over Pine Mountain in Letcher County, vehicles over 30 feet long are still banned from the highway. The ban went into effect March 12, 2001 after a traffic study conducted at the request of the Pine Mountain Task Force. 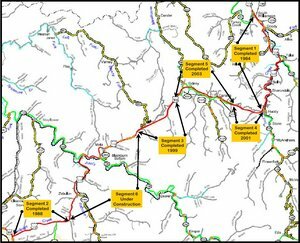 A 20.7 mile project to build to widen US 119 to four lanes from Pikeville to the West Virginia border could be complete in 2006. The project began in 1975. The project cut through three mountains. Nine out of ten sections of the project have seen some construction, and many are now complete. The transportation cabinet is expected to let contracts for the tenth and final segment this month. When a 7.2-mile long project to widen and straighten US 119 on Pine Mountain is complete, the state will not plant non-native plant species along the road. The road is near a state nature preserve, so the state plans to take steps to preserve the mountain ecosystem. Local residents are concerned about the impact road work on US 119 is having on Pine Mountain in Letcher County. The Kentucky Transportation Cabinet is currently in the process of straightening several curves on US 119's crossing of Pine Mountain. This work is causing much more of the mountain to be stripped than local residents had expected. The state plans to be eventually build a tunnel through Pine Mountain. The current road work is a stopgap measure until the tunnel can be constructed. 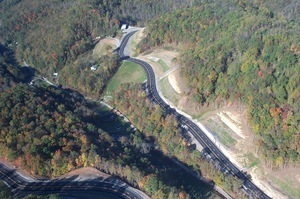 US 119 over Pine Mountain has been closed to vehicles over 30 feet for over a year because such vehicles were involved in an inordinate amount of crashes. The Appalachian Regional Commission (an agency of the federal government) plans on rebuilding parts of US 119 and US 460 in Eastern Kentucky. Work on US 119 between Pikeville and Belfry in Pike County is currently under way. This road will cut through 6 mountains. The reconstruction of US 460 in Pike County is another ARC project. ARC will also be funding a 1.8 mile tunnel through Pine Mountain in Letcher County. The two-lane tunnel will be the 3rd longest vehicle tunnel in the United States. The Lexington Herald-Leader reports in this article that a project to improve US 119 across Pine Mountain will begin this spring; however, trucks will probably still be banned from the highway due to remaining hairpin curves. A project to construct a tunnel through the mountain is being studied, but it may take 20 years to complete such a project. This Courier-Journal article and this Herald-Leader article report that the KYTC will seek money from Appalachian Regional Commission to build a tunnel for US 119 through Pine Mountain in Letcher County.